Teeth whitening is an investment that yields long-term returns and fits most lifestyles and budgets. At Apollo Clinic’s Dentistry Centre, we strive to provide world-class dental services which are affordable. Our range of teeth whitening services is comprehensive enough to meet the needs of every type of dental problem. Teeth whitening is a process that lightens your teeth and helps remove discolouration and stains. It is one of the most popular cosmetic dental procedures as it can significantly enhance facial appearance. Teeth whitening is not a one-time process. You would need to make regular visits to the dentist to maintain the whiteness. Ageing – Beneath the outer, white part of your teeth (enamel) is a softer, yellowish area called dentin. The exterior enamel starts getting thinner over time due to brushing and other factors and more of the dentin starts showing through. Trauma – When you hurt your mouth, your tooth may change colour as it responds to the injury by placing more dentin, which is a darker layer below the enamel. Food and beverages – Certain food and drinks have intense colour pigments called chromogens which attach to the enamel. Tea, coffee and red wine are some of the major drinks that cause staining. Medication – Pigmentation of teeth could be a side effect of high blood pressure medication, antipsychotics and antihistamines. Children who are exposed to antibiotics during the formation of their teeth may develop discolouration of teeth as adults. 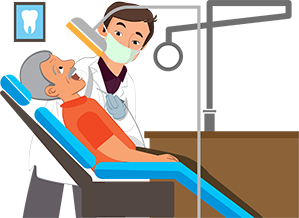 Head and neck radiation and chemotherapy can also darken teeth. Tobacco – There are two substances in tobacco that cause stubborn stains - nicotine and tar. Nicotine is colourless, but when it mixes with oxygen, it turns into a yellowish, staining substance. Tar is a naturally dark substance. At Apollo Clinic’s Dentistry Centre, we have advanced technical equipment and a team of dedicated dentists to deliver the best teeth whitening services. Depending on the cause of tooth discolouration, your dentist will advise on the right whitening procedure. Teeth whitening treatment is a procedure wherein a bleaching solution is used to lighten the existing shade of teeth by a shade or two. Your dentist will first apply a protective gel to your gums or a place a rubber shield to protect your gums. The bleach is then applied to your teeth. At our Dentistry Centre, we also provide laser treatment for teeth whitening. With teeth whitening laser treatment, you can have whiter teeth is just one session. We, at Apollo Clinic, have a team of dentists who are highly skilled and experienced. Our state-of-the-art equipment includes self-laminating fibre optic hand piece, ultrasonic and a 70 KVA dental X-ray multipurpose machine. We are well-equipped to provide the best-in-class teeth whitening treatments.